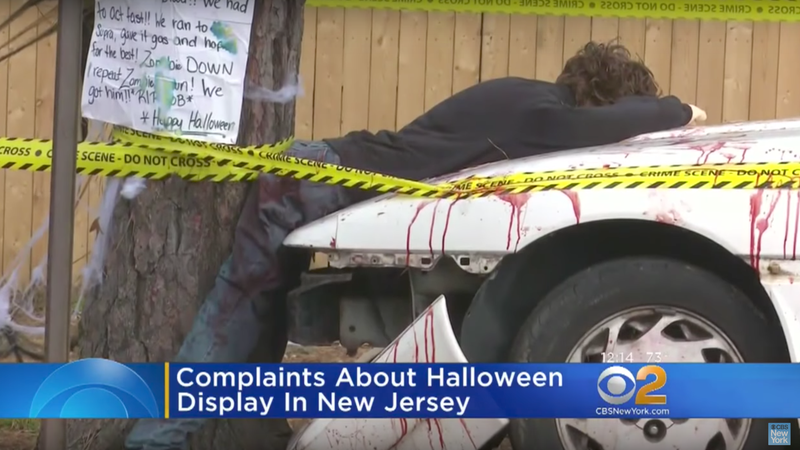 CBS New York reports that homeowners Kevin and Krysten Negrotto consider the scene with a Mark III Supra pinning a “zombie” to a tree in their front yard to be a creative display for trick-or-treaters. But the two have been getting nasty messages about it, so much so that Kevin Negrotto declined to go on camera for an interview with the outlet. The original display did not have the extra zombie in it, according to CBS New York. The outlet reports that police in Ocean County, New Jersey were slammed with calls complaining about the scene, and that after police came by the house, the Negrottos added a fictional story about “Bob” turning into a zombie after drinking contaminated water near a power plant. They also added the body of Cindy the zombie on the ground after the police visit, according to the report. The Facebook post that appears to be from Krysten Negrotto also elaborated on the story behind the zombie car-crash scene, which she said was her son’s idea. Her son, she said, loves Supras and came up with “Zombie Bob.” Krysten and Kevin Negrotto just made his idea happen, the post said.